Hope you all don’t die of shock that I’m actually posting two days in a row. I think it just might be a record. I wanted to show you my latest table top creation in my dining room. You see the top of the table had gone missing and I found it a few days ago…so I decided to keep the ball rolling and do a new arrangement. I wanted something light and summery but with just a hint of that F-word…Fall. Call me crazy but I’m actually feeling ready. This summer has been so dang hot. I had almost everything I needed. The only thing I bought were the cat-tail-ish looking stems. I have had this set of three lanterns for several years. They are a set of three in a hard-to-find ivory color. They move around my house and so far I have not grown tired of them. Not sure I ever will. 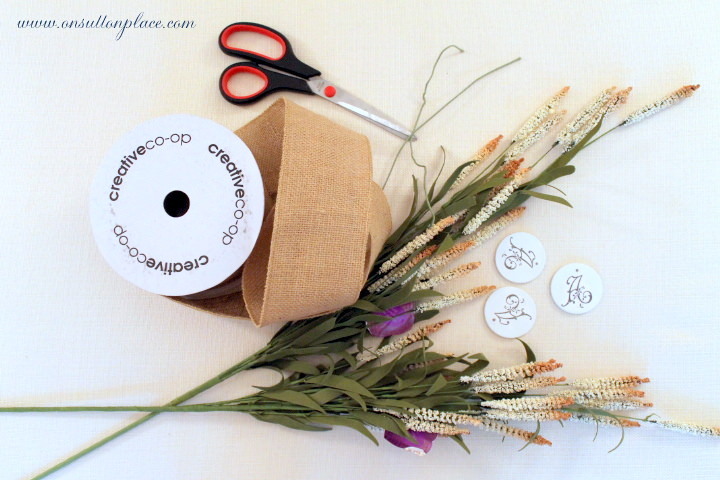 I made the bows first from this great burlap ribbon. It’s fabulous and makes the prettiest bows. After I attached the bows I added the stems…some on top of the bow and some underneath. I just stuck them in the bow without any glue. I got the little monogrammed tags from a shop on Etsy called French and Sparrow. Be careful if you visit because you will want one of everything. I pressed one of my grain sacks to use as a runner. 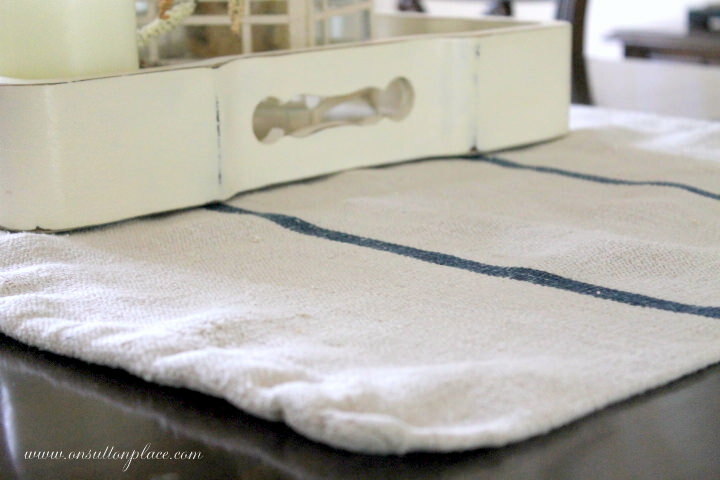 The layering of the grain sack and tray on the table adds interest and seems to take up more space. This is a gorgeous grain sack. The ties are still attached. I always feel like I’ve hit the jackpot when I get a sack with the ties still there. This didn’t take very long and will get me all the way to September. If I added some pumpkins or gourds I could feasibly make it last until Christmas! Can we get an update on how your assistant is doing? You get the idea. So here you go Liddy and Steven…the dog is on the blog. So beautiful……you are amazing !!! Oh Ann – that is just stunning! And I’m so glad I spotted your tray because I just painted a tray with ASCP Old White and have been flip flopping between distress/don’t distress … I’m thinking distress now!!!! … and I’m with the kids. Love the assistant shot! Oh, it’s so beautiful! Perfect for now and FALL! Just passing out party favors today. In addition to the first two prizes, I made a tag for each Snow in July guest. I have most of my guests’ mailing addresses from other times, but I’m still missing a few including yours. When you have a chance, please stop by the shop and email me your mailing info so that I may send you your tag. These are delightful! 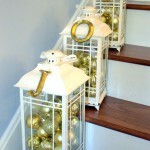 I love your beautiful tray and pretty lanterns! I love your arrangement. I’m kinda anxious to use some orange in my decor too. Can hardly wait to have a little nip in the air. It’s my favorite time of year. Your new arrangement looks so pretty. 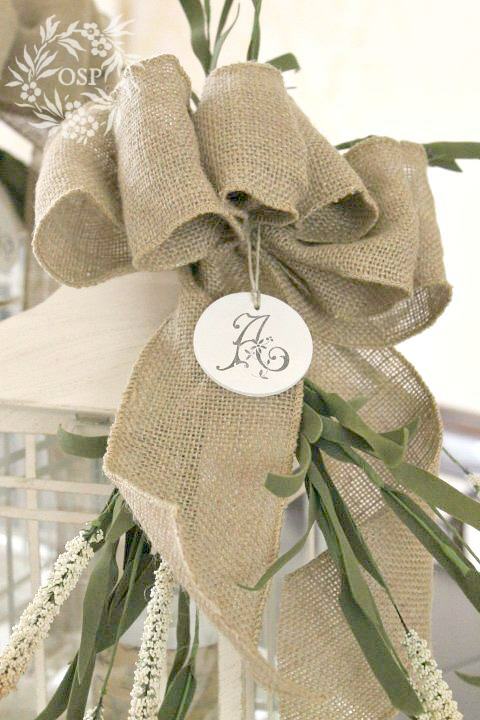 I love burlap ribbon. It’s nice that it can used year round. 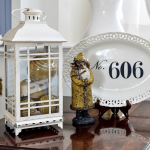 It really has a summery look to it anyway which makes it perfect on your lanterns! Is your dog’s name Kelly? She is so cute! You blog is so clean and neat. Even the dog is so cute..
Ann, I’m glad to find your blog and follow you! I love your vignette, and can see it sailing through the entire year with updates. Stay cool, winter’s almost here! This is such a pretty centerpiece, even if it does make me think a little of the “F” word. And your blog doggie is so cute! It looks like she has just been waiting for a chance to steal the show on your blog. That is lovely, but I love your assistant even more. She’s so cute. Such a precious face. Soft, inviting and love the layering! Where do you get your grain sacks? They’re lovely. Hope you’ll stop over for a visit at Quirky Vistas sometime. I love what you did with the Lanterns! Very nice. Gorgeous arrangement. You make beautiful bows….the whole thing looks very pottery barnish…well done! I am having fun visiting Marcia’s link party….oh…and love the dog photos too! Ann, your centerpiece is a feast for the eyes, I tell ya! 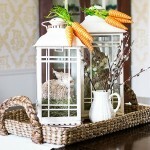 Those burlap bows on top of those lanterns are gorgeous, especially with the little cattails! I spray painted some yellow lanterns white, and they are on my mantel. When I decide to do a fall display, they may just have some burlap bows on top! 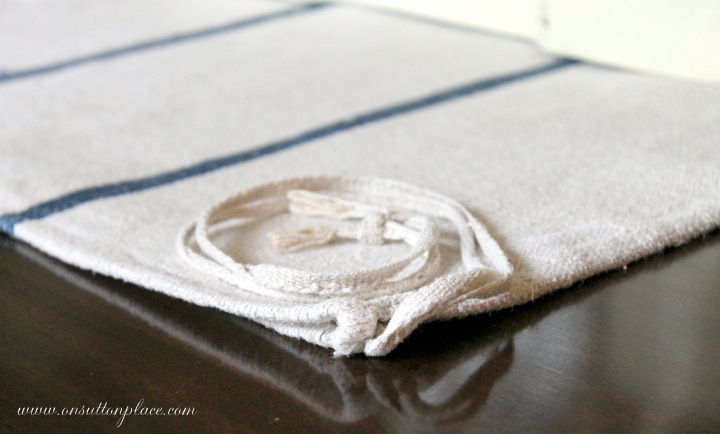 Love the grain sack, the tray, everything…. I visited the Etsy shop where you got those adorable clay tags and you are right. I’d like one of everything. You’ve outdone yourself yet again. You have such an eye for details. I love that burlap ribbon…and the dog (Kelly) is beyond cute! 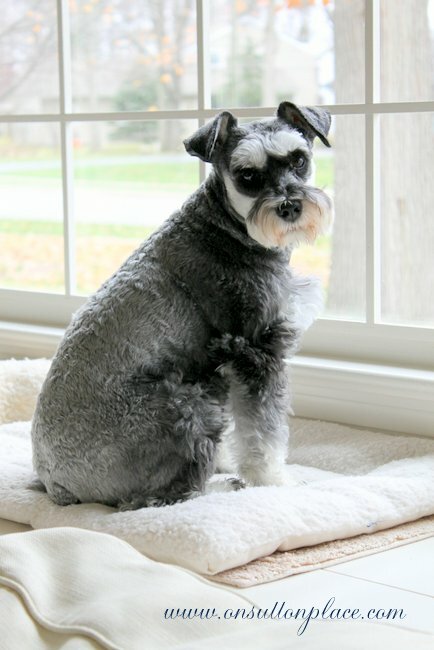 Got a schnauzer named Bailey, so I know what good assistants they are! Beautiful centerpiece! And you have a very lovely blog. I enjoyed visiting you. Oh Ann, that is a fabulous centerpiece. 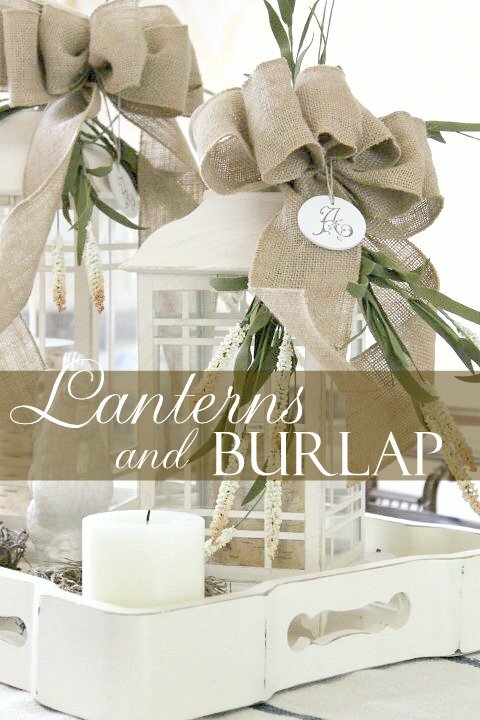 I love the burlap bows on the lanterns. It will look great through fall with a few additions. Great idea, I just love it. Ann, such a gorgeous display! The creamy tones make it easy to coordinate with any detail you add. I can see this display lasting well through the holiday season. You were so smart to come up with such a versatile design. Lovely! Just love the centerpiece. Your assistant is quite photogenic, and I understand your kids wanting to see more of her on the blog. She is a doll. I can relate, as when my kids come home it is usually to see the dog (Haley, a very charming little Bichon), not me. So sorry you are having such a hot summer; I just am miserable in the heat. I live in central CA, about 10 minutes from the coast but still close to the mountains. I was so happy yesterday that the sun came out. We had had overcast, foggy, winter-like weather for 3 days, and I was not happy. I always feel so much better when I see the sun come up in the morning. Looking forward to your surprise tomorrow. Such a gorgeous centerpiece! 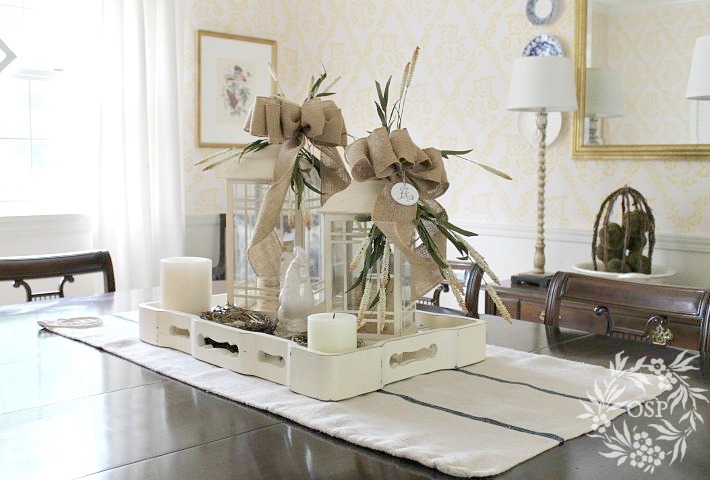 I love the ivory colored lanterns, and the burlap and stems are absolutely perfect! I love all the subtle colors: they look so great together! Kelly is too cute. I am such a dog lover that I love puppy posts!!! Beautiful vignette, Ann! I love the lanterns with the tray and candles. The colors are so soothing and I am really liking the monochromatic look. The bows look great and I think you’ve added just the right amount of Fall to say you are ready! ANN!!! I am speechless. This is absolutely PERFECT for our Snow in July party. 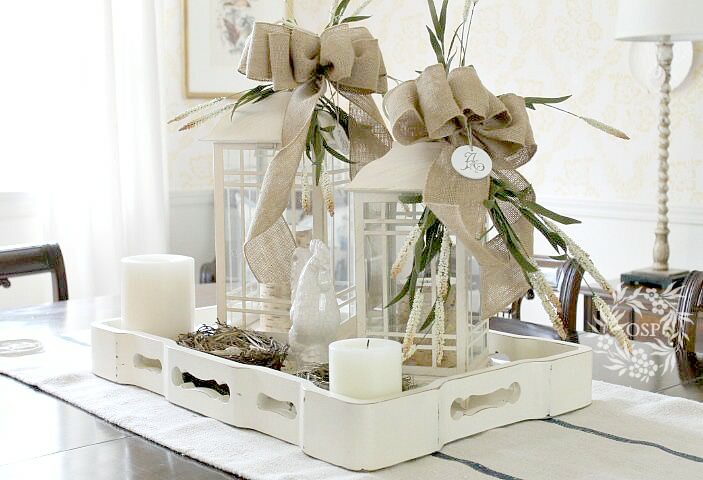 I am head-over-heels in love with your lanterns all dressed up in burlap and cool wintry whites. Oh my!!! I told you that you’re genius. ABSOLUTELY BEAUTIFUL, my friend. Thank you for playing along with us and bringing your assistant along is absolutely a joy. Keep creating and dreaming, my friend. Yay, I can finally see your blog this morning. Cute centerpiece and your dog is beautiful. Love that grain sack. Love the whole arrangement. I agree the ivory lanterns are a rare find. I love the cattails pointing downward, that gives it great creativity. The shape of the tray, with all its curvy lines is very unique also. Love it all, and I agree enough of the heat already. Just beautiful Ann. 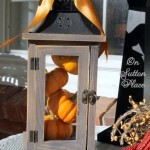 I love lanterns and burlap and you did an outstanding job making it look summery but I can see that you could certainly carry it into fall….and I’m ready for some cooler weather myself! Ann, I have one of those lanterns, maybe I need two! They look great in the white tray with the bows! But I am not thinking fall yet. I love this. Absolutely gorgous!! Absolutely awesome summertime centerpiece – it is a big WOW, Ann!